Grab your pomade and steady girl and head to George Fine's Beef N' Bottle for a trip back in time. Red neon lights beckon you on South Boulevard near Woodlawn Road, where the hand-cut steaks have been prepared the same way since 1958. Reserve a booth and sway to the timeless voices of Frank Sinatra and Nat King Cole in the dimly lit dining room while eating classics like Oysters Rockefeller, lobster tail and choice cuts of beef served with potatoes (baked, fried or home fried). Check the old-school ads and celebrities from Elvis to Diana Ross and Betty Grable lining the walls, and tip your hat to the good ol' days. 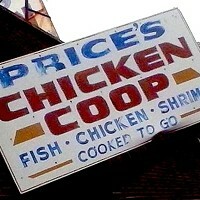 Question the Queen City: Will Price's Chicken Coop join the list of disappearing historic restaurants?